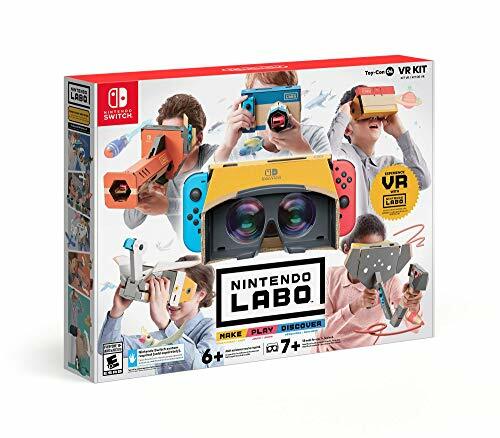 The bottom line is that the full Labo VR kit is incredibly creative, imaginative and great fun while it lasts. However, you might find that fun doesn’t last as long as you wish it did. Nintendo has finally embraced virtual reality with an all-new Nintendo Labo system that turns a Nintendo Switch into a VR headset. It comes with all the tools you need for VR experiences, including game downloads. But, can an elaborate version of Google Cardboard really be that much fun? We’ve been playing with the new VR Kit to find out. Nintendo Labo is a construction kit that enables you to make a number of different Switch accessories using pre-cut cardboard. You get a series of instructions and can transform your Switch into a variety of interactive objects, using the display, Joy-Con controllers and a downloadable game for each build. Different kits are available that can be used to create different Nintendo Labo form factors. The latest additions to the range enable you to explore the world of virtual reality on your console. There are two Labo VR kits to get you into the swing of things: a starter kit includes a base goggle element, a blaster and a "wind-pedal" accessory that you have to blow on; the full VR kit contains the goggles, blaster, "wind-pedal" and a few other Toy-Con projects. Specifically, you get a camera, bird and elephant. For the purpose of this review, we’ve been playing with the full VR kit. As with previous Labo experiences, the set consists of a stack of pre-cut cardboard pieces and a game cartridge that includes building instructions and relevant games. This kit has a couple of dedicated games to play, plus there are a further 64-mini games which open up as you build the various Toy-Con projects. These can then be edited and changed within the Labo coding garage if you get bored - likely with some of them. If you don’t like an element or want to make it easier or harder, you can do so with a bit of hacking behind the scenes. It’s not a simple venture but is appealing for those who want more for their money. It also adds a bit more longevity to the games - some of them are so "mini" they involve a single task, such as hitting a ball. This is the starting point and thrusts you into the world of VR. The Labo VR kit provides a VR goggles case to slip your Nintendo Switch into before going to build more sets for more experiences. The goggles experience on its own is basic, to say the least. Unlike experiences from Oculus, HTC, PlayStation VR or other dedicated VR machines, this is more about experiencing VR for the first time. That said, both my seven-year-old and 11-year-old kids loved it. It’s worth noting that Nintendo doesn’t recommend the kit for any child under seven due to possible eye strain. There is no way to change the focal sharpness, and the 720p resolution on the Switch display is halved the moment you turn on VR (providing half resolution for each eye). Let's just say that it's not the sharpest experience. Although, Nintendo has tried combat this with some creative and immersive experiences through its Toy-Con add-ons. The biggest project in the kit is the Toy-Con blaster, which comes with an estimated build time of three hours. It's akin to the complex piano from the first Labo set. The end result is a monster and sees the VR goggles, and therefore your Switch, slotted into the hilt of the blaster which you place up against your face. Both the Joy-Cons fit into the construction and monitor movement, so the game replicates your physical motions. Further immersion comes through the need to load the blaster with a pump action slider you also have to build. It really does give you a sense that you’ve got a shotgun in your hand. There are two main games: a rather surreal fruit-firing title that has you feeding hungry hippos; plus, a more traditional shoot-em-up that has you flying through a city killing robot bugs. Both are great fun and should offer plenty of replayability. The camera is one of the simplest, but most fun projects. Built to resemble an overly large DSLR, you are basically tasked with taking pictures. However, we really enjoyed taking snaps of various fish in an ocean using the lens as a zoom and the Joy-Con as a shutter. It looks the part and will certainly appeal to younger players, especially as you don't have to enable the VR element to play (that's actually the case with all the games, but it's most useful here). This was my seven-year-old’s favourite. Being Nintendo you can expect things to be a bit surreal from time to time. That's most true when it comes to the bird and wind-pedal Toy-Con projects. After building the strange looking constructions, you use the two to fly a bird around an island, either to explore or dash through rings in the sky. Pushing the wind-pedal up and down wafts air back into your face, giving you a sense you are in the sky. While, the strange-looking bird contraption on your head is more for onlookers to laugh at you. For extra stupidity there’s also a windmill that you have to blow to move. Expect to hear crazy stories of kids hyperventilating. You might tire of this game quickly, but we bet it’s the first one owners will be keen to show off to those that come around. Where the bird is surreal, the Elephant is decidedly convoluted. The project has you build an elephant mask to wear on your face and you then control the trunk. This time, there are two games. One of them is a 3D puzzler that’s is probably the most difficult and most complex of all the games we’ve played so far. Marbles drop down through a series of puzzles and you have to make them bounce, drop or flow in the right direction to complete a circuit. It’s both taxing and challenging in a good way, as you move the trunk to slide the pieces into place. The full Labo VR kit certainly feels more immersive than the original Labo offerings, we just worry that it still suffers from the same concerns of longevity we’ve seen previously. Updates to both Super Mario Odyssey and The Legend of Zelda: Breath of the Wild should quell some of those fears, as they both gain modes to use with the goggles, but only if you also own those games. As with the original Labo kits, I found that my kids loved to build the projects, played for a couple of days, but then quickly tired of the experience. There is enough here to entertain for a couple of evenings, just not for the same sort of length of attention as a triple-A, standalone game. And, there are two other problems that you need to be aware of. First, you can't play for too long before your eyes start to hurt. It's something even Nintendo warns you about - after an hour of play we found we needed a break. The second, for parents, is that you got to store the sets once they are built. The Labo VR projects aren’t small and you might feel you’re overrun with cardboard once everything is built. The bottom line is that the full Labo VR kit is incredibly creative, imaginative and great fun while it lasts. However, you might find that fun doesn’t last as long as you wish it did from the included games. Let's hope that Nintendo adds more VR updates to games in future, like it has with Mario and Zelda. That will give the Labo VR Kit extended life.